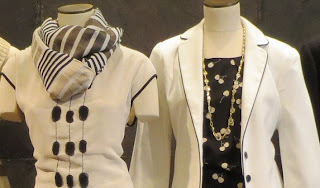 The Coldwater Creek spring 2013 collection includes several different color and style themes, according to store manager Christine, who gave me a lovely shopping tour. For example, the ‘60s Pop theme (photo below) includes classic styling in emerald green and hot pink—two of this spring’s hottest colors. There are a variety of camisoles, including ones with lace trim, to mix and match with no-iron collared shirts as well as blazer and knit tops. The spring collection includes solids, prints and stripes in vivid colors as well as neutrals. Christine is excited about the polka dots in the collection. I’m a huge fan of the dots, too! Here's a polka dot no-iron shirt over a lace-trimmed camisole and paired with white ankle jeans. I'm in love with ankle-cropped slacks and jeans--another hot trend this spring. The Creek's ankle pants and jeans come in black and white as well as several bold colors and prints. Orange is a prominent color in the ‘60s Modern theme. I instantly fell in loved with this breezy scarf top (photo below). Talk about an all-around great summer tunic! And I loved the way it's styled with white slacks. Now that my boys are in their twenties, my husband and I have a few less parenting responsibilities. Last spring, we went to Paris and we're thinking we might sneak away this spring. So when Christine showed me the "Destination" theme, I thought: "perfect." When I travel, I want clothing that packs without wrinkling and is easy to mix and match. The "Destination" collection includes a nice assortment of travel knits (photo below) that meet both requirements. Coldwater Creek’s Black and Khaki theme (photo below) is also new to the Spring 2013 collection. I saw lots of Parisian women over 50 wearing these colors last spring and they looked absolutely smashing--so elegant and sophisticated. The black and white look has been very popular in New York this season, too. I’m so glad Coldwater Creek has embraced lovely neutrals. When it comes to prints, I don't want anything too demure or too brazen. (My demure/brazen days are long behind me!) Instead, I look for pieces with fun, playful prints. I love all the Coldwater Creek prints with curvy shapes--polka dot, shell, cherry and dappling. I've got a feeling this cherry print skirt is going to fly out of the store.